Send white mini roses tucked into a gourmet basket brimming with fresh fruit to spread some sunshine. 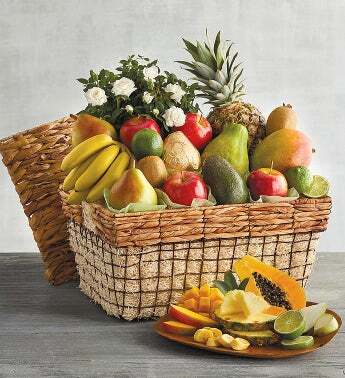 The roses in this Flowers and Fruit Gift Basket can be replanted as a lasting memory of your gift. The fruit starts with our famous Riviera® Pears and includes kiwis, a papaya, and baby bananas. It's a gorgeous gourmet presentation and flower delivery.